2015. Colantoni, L., Steele, J. & Escudero, P. Second language speech: An introduction. Cambridge University Press. 2013. Colantoni, L. & C. Rodríguez Louro (eds.). 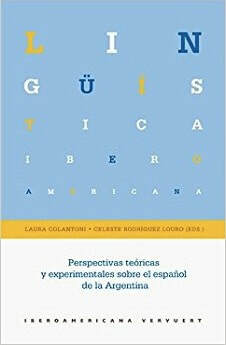 Perspectivas teóricas y experimentales sobre el español de la Argentina. Madrid/Frankfurt: Iberoamericana/Vervuert (32 chapters). 2008. Colantoni, L. & J. Steele. Selected Proceedings of the 3rd Conference on Laboratory Approaches to Spanish Phonology. Somerville, MA: Cascadilla Press. 2018. Radu, M.; Klassen, G., Colantoni, L.; Patience, M.; Pérez Leroux, A. & Tararova, O. The perception and interpretation of intonational contours among L2 English speakers. Linguistic Approaches to Bilingualism. 2018. Steele, J., Colantoni, L., Kochetov, A. Gradient assimilation in French cross-word nasal+velar stop sequences. Journal of the International Phonetic Association 48, 1-22. 2018. Colantoni, L. & Steele, J. The Mixed Effects of Phonetic Input Variability on Relative Ease of L2 Learning: Evidence from English Learners’ Production of French and Spanish Stop-rhotic Clusters, Languages 3(2), 12. 2016. Colantoni, L. & Kochetov, A. Estudio electropalatográfico del debilitamiento de /s/ y /n/ en coda en dos dialectos del español (An electropalatographic study of coda /s/ and /n/ weakening in two Spanish dialets). In: Ana Ma. Fernández Planas (ed.). 53 reflexiones sobre aspectos de la fonética y otros temas de lingüística. Barcelona: Laboratori de Fonètica de la Universitat de Barcelona, pp. 29-37. 2016. 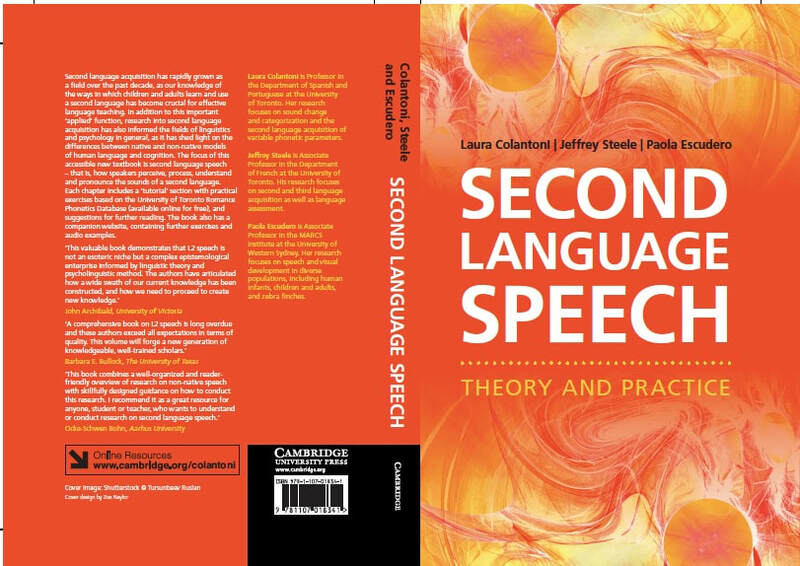 Colantoni, L. The mestizo speech: Participant selection and task choice in L2 speech. Cuza, A. Czerwionka, L. & Olson, D. (Eds.). Inquires in Hispanic Linguistics: From Theory to Empirical Evidence Amsterdam: John Benjamins, pp. 131-148. 2016. Colantoni, L., Klassen, G., Patience, M., Radu, M., & Tararova. Task-effects in the L2 perception and production of English sentence-types by L1 Spanish speakers. Proceedings of Speech Prosody 8. Boston: Boston University (http://www.isca-speech.org/archive/SpeechProsody_2016/pdfs/277.pdf). 2016. Mazzaro, N., Cuza, A. & Colantoni, L. Age effects and the discrimination of consonantal and vocalic contrasts in heritage and native Spanish. Romance linguistics 2013:Selected Proceedings of the 43th Linguistic symposium on Romance Languages, C. Tortora, M. den Dikken, I. Montoya, & T. O’Neill (Eds). Amsterdam: John Benkamins, pp. 277-300. 2016. Colantoni, L., & Hualde, J. I. Constraints on front-mid vowel gliding in Spanish. The Syllable and stress, R. Núñez Cedeño (ed. ), The Hague: Mouton de Gruyter, pp. 1-28. 2016. Colantoni, L., Mazzaro, N. & Cuza, A. Task related effects in the prosody of Spanish heritage speakers. Intonational grammar in Ibero-Romance: Approaches across linguistic sub-fields, M. Amstrong, N. Henrikssen, M. Vanrell (Eds). Amsterdam: John Benjamins, pp. 3-23. 2015. Colantoni, L., Klassen, G., Patience, M., Radu, M., & Tararova, O. Increasing context: L2 production of English intonation by L1 Spanish and L1 Mandarin speakers. Proceedings of the 18th Congress of the International Phonetic Association, M. Wolters, J. Livingstone, B. Beattie, R. Smith, M. MacMahon, J. Stuart-Smith & Jim Scobbie (Eds). Glasgow: University of Glasgow (0813). 2015. Colantoni, L., Marasco, O., Steele, J. & Sunara, S. Phonological and phonetic aspects of the L2 acquisition of French and Spanish stress. Selected Proceeding on the 6th conference on Laboratory Approaches to Romance Phonology, E. Willis, P. Martín Butragueño, & E. Herrera Zandejas (Eds). Somerville, MA: Cascadilla Proceedings Project, pp. 129-144. 2015. Colantoni, L. Laboratory Approaches to Romance phonology: Contributions and challenges to the study of sound variation and change. Selected Proceeding on the 6th conference on Laboratory Approaches to Romance Phonology, E. Willis, P. Martín Butragueño, & E. Herrera Zandejas (Eds). Somerville, MA: Cascadilla Proceedings Project, pp. 1-16. 2014. Ortega-Llebaria, M. & L. Colantoni. The L2 acquisition of English intonation: Relations between form-meaning associations, access to meaning and L1 transfer. Studies in Second Language Acquisition 36 (2). 331-353.